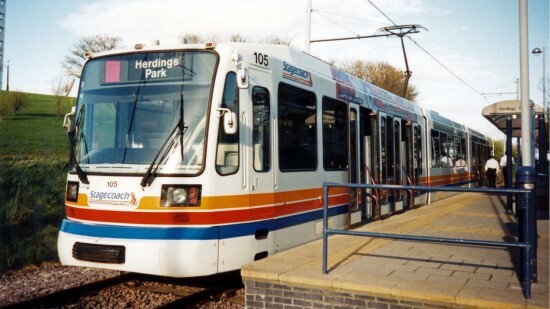 This view features 105 on 7th April 1999 – a little over a year since Stagecoach took control of the system in December 1997. The tram is in the first Stagecoach livery and is operating a Purple route service between Herdings Park and Meadowhall. It is captured here at Herdings Park with its destination blind yet to be changed for its next journey with the crew waiting out time at the far end of the platform. It also features external advertising above the windows.